Once a veterinary nurse, Caren then pursued a rewarding career being mum to her children, 13-year-old pug and 3-year-old Staffordshire Bull Terrier. Caren also spent ten years working with children in SEN settings before joining CDC and volunteered in dog rescues for many years. 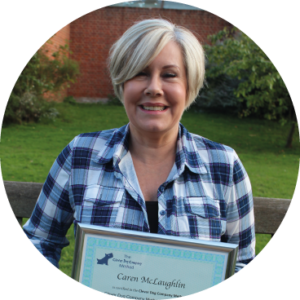 Caren’s true passion is to help owners realise their own dogs’ potential and see their own confidence in training grow. As a Real Dog Yoga Instructor, Caren is certainly in tune with dogs on a holistic level, which is an invaluable advantage for any owner wishing to help their dog progress fully.